Born in Illinois, Johan began his undergraduate studies at the University of Arizona, before going on to receive his Ph.D. in Anthropology from the University of Vienna. He conducted anthropological research for more than ten years in Nepal, specializing in culture change, sacred landscape, and shamanism, and also directed Peace Corps Training Projects. 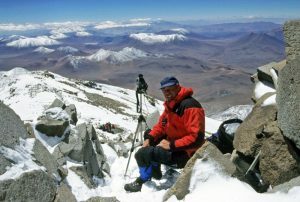 Since 1980 he has undertaken historical and archaeological research in Peru, Bolivia, Chile, and Argentina focusing on sacred landscape and high-altitude archaeology. His research has been featured in several TV documentaries, including National Geographic Explorer, BBC, NOVA, PB and Discovery. He has over seventy publications, including six books. He is currently updating and archiving his Andean and Himalayan research materials. 2013 Inca Mummies on Andean Peaks. In The Modern Explorers, Robin Hanbury-Tenison and Robert Twigger (eds.) pp. 288-293, Thames &amp; Hudson, London. 2012 Las Montañas Sagradas y las Culturas Preincaicas de los Andes. In América: Tierras de Montañas y Volcanes. Huellas de la Arqueología. Margarita Loera Chávez y Peniche, Stanislaw Iwaniszewski, and Ricardo Cabrera (eds. ), pp. 51-71, Instituto Nacional de Antropología y Historia (INAH), México, D.F. 2010 Inca Rituals and Sacred Mountains: A Study of the World’s Highest Archaeological Sites. (Co-authored with Constanza Ceruti), University of California (Cotsen Institute of Archaeology), Los Angeles. 2010 El Mistero Eterno de Machu Picchu. In La Ciudad Inca de Machu Picchu. David Cases- Pallares (ed. ), pp. 2-3, Editorial Sol90, Buenos Aires. 2009 Arqueología Subacuática y Paisaje Sagrado: Investigaciones en los Lagos del Nevado de Toluca. In Las Aguas Celestiales: Nevado de Toluca, Pilar Luna, Arturo Montero, and Roberto Junco (eds. ), pp. 30-31, Instituto Nacional de Antropología y Historia (INAH), México, D.F. 2007 Inca Mummies: Child Sacrifice on Andean Peaks. In Discovery! : Unearthing the New Treasures of Archaeology Brian Fagan (ed. ), London: Thames & Hudson, pp. 100-105. 2005 The Search for Inca Mummies. Dig 7(9): 28-30. 2003 Into the Hidden Crater– An Andean Adventure. Explorers Journal 81(3): 16-23. 2003 Radiologic Evaluation of the Llullaillaco Mummies. (Co-authored with Carlos Previgliano, Constanza Ceruti, Facundo Arias, and Josefina González). American Journal of Roentgenology 181: 1473-1479. 2002 Machu Picchu: El Centro Sagrado. Cusco: Instituto Machu Picchu. 1996 The Enigmatic Nazca Lines: Sacred Symbols on the Land. Site Saver: The Newsletter of Sacred Sites International Foundation 6(3): 2, 5, 7. 1995 House of the Sun: The Inca Temple of Vilcanota. Latin American Antiquity 6(4): 340- 349. 1993 Llullaillaco: An Investigation of the World&#39;s Highest Archaeological Site. Latin American Indian Languages Journal 9(1): 31-54. 1992 Tiahuanaco, Centro Sagrado de los Andes. In Guía Cultural y Turística de Bolivia, P. McFarren (ed. ), La Paz: Fundación Cultural Quipus, pp. 203-242. 1992 An Archaeological Investigation of Inca Ceremonial Platforms on the Volcano Copiapo, Central Chile. In Ancient America: Contributions to New World Archaeology, N. Saunders (ed. ), Oxford: Oxbow Books, pp. 145-172. 1991 Shangri-la and the Hidden Valleys. In Insight Guides Nepal, Lisa Choegyal (ed. ), Singapore: APA Publications, pp. 256-259. 1991 Machu Picchu: The Sacred Center. Lima: Nuevas Imágenes. 1990 Tiahuanaco, Sacred Center of the Andes. In The Cultural Guide of Bolivia, P. McFarren (ed. ), La Paz: Fundación Cultural Quipus, pp. 151-181. 1988 The Nazca Lines: A New Perspective on their Origin and Meaning, Lima: Editorial Los Pinos (4 th revised edition). 1987 Las Lineas de Nazca: Un Nuevo Enfoque sobre in Origen y Significado. Lima: Editorial Los Pinos (1st Spanish edition) (2nd revised edition 1988). 1980 Ascensión al Volcán Licancabur y Otros Nevados Revista del Centro de Investigaciones Arqueológicos de Alta Montaña 4: 41-44, San Juan (with George Serracino and Ana Maria Barón). 1977 Raji (Nepal)-Shaman Initiation. Publications to Scientific Films of the Institute for Scientific Film Series 7(42), 9 pp., Göttingen. 1977 Raji (Nepal)-Divination and Magical Treatment of an Illness. Publications to Scientific Films of the Institute for Scientific Film Series 7(41), 8 pp., Göttingen. 1977 Kusunda (Nepal)-Consecration of Hunting Equipment. Publications to Scientific Films of the Institute for Scientific Film Series 7(40), 7 pp., Göttingen. 1977 Kusunda (Nepal)-Construction of a Lean-To during Hunting. Publications to Scientific Films of the Institute for Scientific Film Series 7(39), 7 pp., Göttingen. 1977 Newar, Kumhale Caste (Nepal)-Pottery- Making. Publications to Scientific Films of the Institute for Scientific Film Series 7(38), 9 pp., Göttingen. 1977 Newar, Udhas Caste (Nepal)-Construction of a Water Pipe. Publications to Scientific Films of the Institute for Scientific Film Series 7(37), 7 pp., Göttingen. 1976 Shamanism and Spirit Possession: The Definition Problem. In Spirit Possession in the Nepal Himalayas, J. Hitchcock &amp; R. Jones (eds. ), New Delhi: Vikas Publishing House, pp. 12-20. 1974 Underwater Archaeology in Austria: A Preliminary Report. International Journal of Nautical Archaeology and Underwater Exploration 3(2): 320, London. 1973 Deskriptive Analyse von Schamanismus und Hexerei bei den Purbia Raji Sudwest– Nepals, Ph.D. Dissertation, University of Vienna, 302 pp. 1969 Preliminary Report on Wood Working in Nepal. Anzeiger der philosophische- historischen Klasse der Osterreichischen Akadamie der Wissenschaften 106: 110-115, Vienna. 1969 Research with the Raji in Western Nepal: A Brief Summary. Bulletin of the International Committee on Urgent Anthropological and Ethnological Research 11: 33- 34, Vienna. 1968 The Kusunda: Ethnographic Notes on a Hunting Tribe of Nepal. Bulletin of the International Committee on Urgent Anthropological and Ethnological Research10: 95- 110, Vienna.